This article shows you how to download Showbox movie app for all iPhone devices, install Showbox on iPhone/iPad & PC, and provides you with good Showbox alternatives for iPhone/iPad. Showbox is a free TV shows streaming and movies app for smart phone. It allows users to access and download HD movies, videos & TV serials totally for free. People love Showbox movie app because it is free, convenient, flexible and safe & easy to use. So far, Showbox app is available for the Android system, iOS users may wonder: if there a version of Showbox for iPhone? The answer is YES. Below we will show you ways to download Showbox movie app for iPhone/iPad, and watch free HD movies on iOS devices anytime. What's more, we will also introduce some good Showbox alternatives for iPhone. Since the Showbox movie app is not officially available in App Store, you have to use other source to download Showbox to your iPhone (note that Showbox is named as Movie box for the iOS system). The following are two ways to install Showbox movie app on your iPhone, iPad (iOS devices running iOS 7 or higher including iOS 10). This way is highly recommended to non-jailbreak iOS users. 3. go to App tab, search Movie box and download it. This Showbox app will install to your iPhone automatically once it is finished downloading. In this way, you can install Showbox for iPhone directly, without using other tools. But you have to judge which Showbox for iPhone download link is reliable. When the installation is completed, the Movie box icon will be created in the app section. Now, you can run this Showbox movie app and watch your favorite TV and movies. Of course, you may feel it is quite cumbersome to install Showbox for iPhone, and want to find similar apps like Showbox movie app. In fact, there are some free movie apps for iPhone/iPad considered as Showbox alternatives that you can try, for example, Popcorn Time, Sky HD, Hulu App, Crackle App and etc. In addition to getting Showbox app for iPhone/iPad, you may be interested in how to get Showbox for PC and download unlimited TV series and movies to watch. Here, we introduce you the easiest and quickest way to get Showbox for PC. Before downloading Showbox for PC, you will require an Android emulator that is used to run all Android apps on laptops. At the same time, you have to make sure your PC meets the requirements. You PC runs on Window 7, Windows 8/8.1 or Windows 10; your PC has 2GB space at least and appropriate audio & video drivers. Now, let’s go and get Showbox for PC. 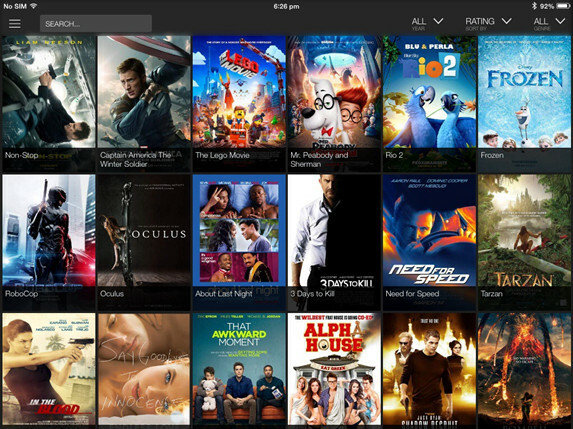 Now, you are successfully download Showbox for PC, and can get unlimited excellent movies to enjoy.